Conjunctivitis is a common eye disease, especially in children. It may affect one or both eyes. Some forms of conjunctivitis are highly contagious and can easily spread in schools and at home. While conjunctivitis is usually a minor eye infection, sometimes it can develop into a more serious problem. There are three main types of conjunctivitis: allergic, infectious and chemical. The cause of conjunctivitis varies depending on the type. Allergic conjunctivitis occurs more commonly among people who already have seasonal allergies. They develop it when they come into contact with a substance that triggers an allergic reaction in their eyes. Giant papillary conjunctivitis is a type of allergic conjunctivitis caused by the chronic presence of a foreign body in the eye. People who wear hard or rigid contact lenses, wear soft contact lenses that are not replaced frequently, have an exposed suture on the surface of the eye or have a prosthetic eye are more likely to develop this form of conjunctivitis. Bacterial conjunctivitis is an infection most often caused by staphylococcal or streptococcal bacteria from your own skin or respiratory system. Insects, physical contact with other people, poor hygiene (touching the eye with unclean hands), or using contaminated eye makeup and facial lotions can also cause the infection. Sharing makeup and wearing contact lenses that are not your own or are improperly cleaned can also cause bacterial conjunctivitis. Viral conjunctivitis is most commonly caused by contagious viruses associated with the common cold. It can develop through exposure to the coughing or sneezing of someone with an upper respiratory tract infection. Viral conjunctivitis can also occur as the virus spreads along the body’s own mucous membranes, which connect the lungs, throat, nose, tear ducts and conjunctiva. Since the tears drain into the nasal passageway, forceful nose blowing can cause a virus to move from your respiratory system to your eyes. Ophthalmia neonatorum is a severe form of bacterial conjunctivitis that occurs in newborn babies. This is a serious condition that could lead to permanent eye damage if it is not treated immediately. Ophthalmia neonatorum occurs when an infant is exposed to chlamydia or gonorrhea while passing through the birth canal. For several years, U.S. delivery rooms have applied antibiotic ointment to babies’ eyes as a standard prophylactic treatment. Chemical Conjunctivitis can be caused by irritants like air pollution, chlorine in swimming pools, and exposure to noxious chemicals. Patient history to determine the symptoms, when the symptoms began, and whether any general health or environmental conditions are contributing to the problem. Visual acuity measurements to determine whether vision has been affected. Evaluation of the conjunctiva and external eye tissue using bright light and magnification. Evaluation of the inner structures of the eye to ensure that no other tissues are affected by the condition. Supplemental testing, which may include taking cultures or smears of conjunctival tissue. This is particularly important in cases of chronic conjunctivitis or when the condition is not responding to treatment. Using the information obtained from these tests, your optometrist can determine if you have conjunctivitis and advise you on treatment options. Reduce or lessen the course of the infection or inflammation. Prevent the spread of the infection in contagious forms of conjunctivitis. Allergic conjunctivitis. The first step is to remove or avoid the irritant, if possible. Cool compresses and artificial tears sometimes relieve discomfort in mild cases. In more severe cases, nonsteroidal anti-inflammatory medications and antihistamines may be prescribed. People with persistent allergic conjunctivitis may also require topical steroid eye drops. Bacterial conjunctivitis. 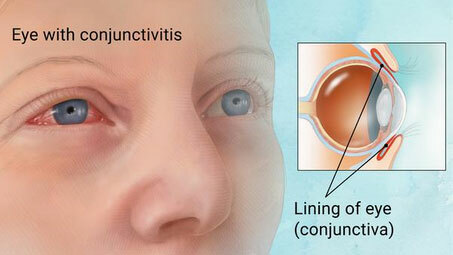 This type of conjunctivitis is usually treated with antibiotic eye drops or ointments. Bacterial conjunctivitis may improve after three or four days of treatment, but patients need to take the entire course of antibiotics to prevent recurrence. Viral conjunctivitis. No drops or ointments can treat viral conjunctivitis. Antibiotics will not cure a viral infection. Like a common cold, the virus has to run its course, which may take up to two or three weeks. Symptoms can often be relieved with cool compresses and artificial tear solutions. For the worst cases, topical steroid drops may be prescribed to reduce the discomfort from inflammation. However, these drops will not shorten the infection. Chemical conjunctivitis. Careful flushing of the eyes with saline is a standard treatment for chemical conjunctivitis. People with chemical conjunctivitis also may need to use topical steroids. Severe chemical injuries, particularly alkali burns, are medical emergencies and can lead to scarring, damage to the eye or the sight, or even loss of the eye. If a chemical spills in your eye, flush the eye for several minutes with a lot of water before seeing your medical provider. Contact lens wearers may need to temporarily stop wearing their lenses while the condition is active. Your doctor can tell you if this is necessary. If you developed conjunctivitis due to wearing contact lenses, your eye doctor may recommend that you switch to a different type of contact lens or disinfection solution. Your optometrist might need to change your contact lens prescription to a lens that you replace more frequently. This can help prevent the conjunctivitis from recurring. Don’t touch your eyes with your hands. Change your towel and washcloth daily, and don’t share them with others. Discard eye cosmetics, particularly mascara. Don’t use anyone else’s eye cosmetics or personal eye-care items. Follow your eye doctor’s instructions on proper contact lens care. You can soothe the discomfort of viral or bacterial conjunctivitis by applying warm compresses to your affected eye or eyes. To make a compress, soak a clean cloth in warm water and wring it out before applying it gently to your closed eyelids. For allergic conjunctivitis, avoid rubbing your eyes. Instead of warm compresses, use cool compresses to soothe your eyes. Over-the-counter eye drops might also help. Antihistamine eye drops can alleviate the symptoms, and lubricating eye drops can rinse the allergen off the surface of the eye. See your doctor of optometry if you think you have conjunctivitis. He or she can diagnose the cause and prescribe the proper treatment.